I'm watching you scramble, all confused. "But this one is HARD!" "But where do we even START?" You make me laugh. Call yourselves sorcerers when you can't even identify six of the most well-known magical alphabets in the world? Time is a-ticking, and skulduggery@harpercollins.co.uk are awaiting your responses EVER so anxiously. I've decided that if you can't figure out where I am in the next three days, I'm going to kill one of you. Because I know who you are. 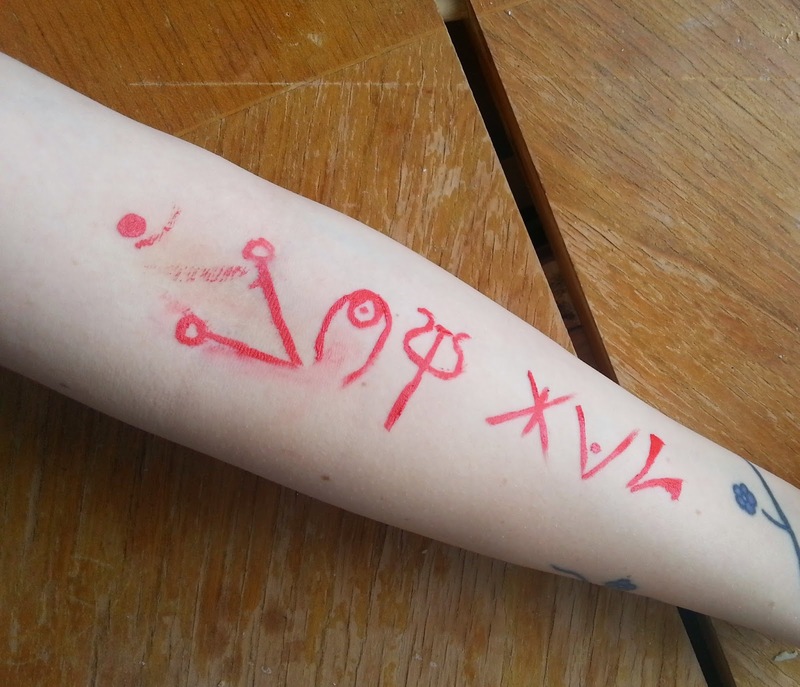 THE FIRST AND LAST SYMBOLS ARE WRITTEN IN ENOCHIAN AND MALACHIM. Is this the third clue? Are we supposed to post what we think the answer is in the comments? This is the third clue. We have to decipher the symbols. Two of which I have. Does anyone have a spare magic dictionary that I can borrow? Does anyone know if the blue symbol on the end counts? I think the second one that in the first set of 3 is an "F"
Does Silas talk with an Italian cross with crazy accent? Beacuse time is a-ticking seems pretty awesome in an Italian accent. the third symbol looks like Pictish for "F"
He reminds me of Loki. @fateful isn't it I in pictish? He said it was the hardest clue yet but it's only taken us an hour to decipher. Something's wrong. wait, if it is I and the last letter is X then it might be six! Yey Fabu! Let's hope we're right! Well, a bunch of other people probably beat me to it. But we'll have to see. but is the line supposed to be there? it kinda looks like a smug..
@Silente: I know I am. Seriously, it actually makes me sad . . . :/ He acts like he's so, you know, evil and all, but really he's just attention-grabbing . . . it's probably making him smile so much to have us all scrabbling over it. Or do you feel proud of all the hatred you've earned"
I worked out, using lyrics from a couple of songs, that being hated can actually make people feel better, and I would imagine that Silas gets off on doing things like this because he feels like he's altered the world and that he's made a difference. I think maybe we have to take the letters from different alphabets! The 5th symbol, the X with a vertical line through it, looks like a cyrillic letter, and the one before that maybe greek? Ψ looks Grecian. I'm almost certain it's psi, but it could easily be M or P or something...? Yeah but they're awesome Stat. Is this what we have so far? @Flick YOU HAD STAR LOCKED UP?! I have the last three as T W O but which one are you counting as the first as I have the N and E but for the second and third letter? I guess that "6 magical alphabets" is a clue. Obviously. So you have to take 6 alphabets to find out what it means. She want to be free! I'm still going with Fabi's theory. Not that I've done anything . . .
NIXTWO would make sense with what I've got...! I know. I'm a linguist, man. I'm just... There are a couple of ways this could end up, I'm just trying to be open about possibilities. Why is he in Nevada? But I don't really know how to plug in the numbers.. I got Nevada if the second coordinate was west, China if it was east. The Nevada one was middle-of-nowhere, though, so I went with the China one. That would be really weird! But thats the problem! Why would Silas use XYZ?? Its only X and Y! So maybe the last two digits are... N, S, E, or W! makes a triangle then maybe try the centre..
Less people to kill in the middle of nowhere, though. What's the going theory here? I find your logic amusing. Elleni, good idea but the final clue is the decimal point to -115, the second co-ordinate. In two hours I can give you all a definite answer on the letters. He doesnt need to bury bodies, remember? ..remember Viv is probably reporting back. well i think the order it 39.04, -115.?? but you're right, we don't know what direction..
Bye Fabi!!!! Thanks for your help!!!!!! How would you bury some one in the middle of the street? Silas Nadir hid the bodies in different dimensions, remember? ugh, i have to go soon! I dont understand any of this! What magical alphabets??? You have 5 minutes to explain yourself over email Viv. Go. Inks, can I have your email if you dont mind? Vivilente is dead. Enjoy your time with Nadir Viv. Sil, he just poofed. Give him some time to explain. He can explain anytime he wants. But its over. I mean he screwed up. Alright, what the hell are you lot arguing over now? Aw, dont be mean to Blakey Kitty! And I said go to hell Viv. You crossed a line. Now duck off. Awwww he's even more adorabubbles now!!!!!!!!!!! Ok but Where??? The Internet or books or....???? (I'm so confused about the 2nd puzzle still.. I'm getting negative numbers. Viv...you realise you just signed your death ish..
Did no one see what Inky just wrote??? ..before Viv pissed him off.